Don Gullett started three straight World Series openers. Chances are he isn’t the name you would think had accomplished that feat. But for a stretch in the 1970’s, Don Gullett was as close to a good luck charm as a team could have. Born in Lynn Kentucky, Gullett excelled in many high school sports and was a big football prospect. He also was worth of being a first round pick for the Cincinnati Reds in 1969. 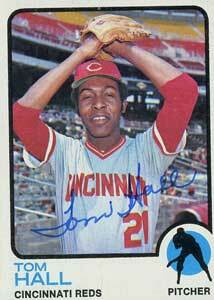 He spent less than a year in the major leagues before he joined Sparky Anderson and the Reds in 1970. That was a pretty good time to show up in Cincinnati with Sparky Anderson. The 19 year old Gullet was used primarily out of the bullpen and pitched to a 2.43 ERA in 77 2/3 innings pitched. He wound up pitching in the post season, earning a save in Game 2 of the NLCS against the Pirates. In the potential clinching Game 3, he came into a 3-2 game in the 9th. There were 2 outs but the tying run was on. Willie Stargell singled but he got Al Oliver to ground out. Less than a year and a half out of high school, Don Gullett clinched the pennant for the Reds. He would throw 3 games in the Reds 5 game defeat at the hand of the Orioles. But the kid who could not legally buy a drink yet was now established in the brand new Big Red Machine. He joined the rotation in 1971, going 16-6 and leading the league with a .727 winning percentage. Gullett was in the rotation when they won the 1972 pennant and 1973 NL West. By 1975, he was money in the bank to throw 200 some odd innings and win in double figures with a low ERA. The Reds were better known for their bullpen, but Gullett was a good go to man in the rotation. Injuries kept him from pitching 200 innings in 1975 but he made up for in in October. In Game 1 of the NLCS, he threw a complete game victory against the Pirates and drove in a run with a single and cracked a 2 run homer. He was a one man wrecking crew. The Reds would sweep the Pirates and the 24 year old was off to his third trip to the World Series. Gullett pitched the opener of the World Series against the Red Sox. He matched Luis Tiant with shutout inning after shutout inning until a 7th inning rally put the Red Sox up for good. He made up for the Game 1 loss by pitching into the 9th inning in Game 5. He went 8 2/3 innings, allowing 2 runs and earned the 6-2 decision that put the Reds on the verge of the World Series title. A series of rain delays and the epic Game 6 gave Gullett a chance to pitch Game 7. He let up 3 early runs and was lifted but the Reds bats and bullpen came to his rescue to win it in the 9th. Gullett was a World Series champ. 1976 saw another season interrupted by injuries for Gullett has he managed only 126 regular season innings over 23 games. But by the time the post season began, the Reds were back in it and Gullett took the ball. In Game 1 of the NLCS, he held the Phillies to 2 hits and 1 run and the Reds took the opener, 6-3. Cincinnati would sweep the 3 game set and lined up the World Series for Gullett to throw the opener. He would pitch into the 8th, allowing 1 run over 7 1/3 innings and earned the 5-1 win. The Reds would have a perfect post season, sweeping the NLCS and World Series. Those would be Gullett’s only 2 post season starts as he picked up his second ring. Free Agency was brand new after the 1976 season and Gullett threw his hat into the proverbial ring. After a few weeks, he joined the team he beat and became a New York Yankee through 1982 with a contract that would make him a millionaire. Not bad for a 26 year old. Yankee manager Billy Martin and pitching coach Art Fowler got a lot wins out of Gullett, going 14-4 with the best winning percentage in the AL. But his shoulder issues kept him from reaching 200 innings again. He was ready, however to start the playoffs. This time however, he got clobbered hard in Game 1 of the ALCS against the Royals. He did not appear in the rest of the series. The Yankees would come back and win it in 5. With starters Ron Guidry and Mike Torrez used in the ALCS finale, Martin once again turned to Gullett in a Game 1. For the third straight year, and with two different teams, Don Gullett opened the World Series as a starter. He pitched into the 9th inning but did not get the decision. Paul Blair got the walk off hit in extra innings, putting the Yankees up 1-0. In Game 5, Gullett took the ball with the Yankees up 3-1 in the Series and a chance to win their first title since 1962. But the Dodgers jumped all over Gullett, as he allowed 7 runs in 4 1/3 innings. The Yankees would win it in 6, giving him World Series ring number 3. The World Series Game 5 start in 1977 exposed a series of shoulder injuries to Gullett that reduced his 1978 season to just 8 starts. He would earn World Series ring number 4 that year, but he was in trouble at age 27. This card was issued including his 1979 stats. The picture must have been taken in 1977 or 1978 because he didn’t pitch a game in 1979. Nor did he in 1980. In fact he never pitched in the majors again after 1978. Like a meteor going through the atmosphere, he burned up before his career reached its 10th season. Still a beloved Red, he served as the team’s pitching coach for a while and is in the team’s Hall of Fame. In a career that started before he was 20 and ended before he was 30, he packed more Championships and post season appearances than most players see in their lifetime. The term “No Decision” can be quite misleading when it comes to a pitcher. It implies that they did not have that great of an impact on the outcome of a game. It is even more dismissive for a middle reliever. If a pitcher was not the starting pitcher, did not get a win, a loss or a save, then how could they have been a major factor? In truth many games are won or lost BECAUSE of how pitchers who get lost in the shuffle and ignored in the decision performed. A prime example for that is Reds reliever Tom Hall. The Pirates took a 2 game to 1 lead in the Series, but the Reds tied it up and set up a winner take all Game 5 at Riverfront Stadium in Cincinnati. Don Gullett started for the Reds. 1971 World Series hero Steve Blass took the hill for Pittsburgh. Manny Sanguillen, Richie Hebner and Dave Cash jumped on Gullett in the second inning and put the Pirates up 2-0. The same three hitters, Sanguillen, Hebner and Cash, got hits in the fourth, chasing Gullett and pushed a third run across. Cincinnati started chipping away and by the time Cesar Geronimo homered in the fifth, it was a 3-2 game with the Reds still ahead. Sparky Anderson gave the ball to Tom Hall to start the 6th and keep the game a one run affair. The 24 year old from Riverside California was already a four year Major League veteran when the Reds acquired him from Minnesota before the 1972 season for Wayne Granger. The left hander known as “The Blade” because of his slender build had pitched in the 1969 and 1970 playoffs for Minnesota where he was a spot starter and middle reliever. For the Reds, he filled whatever role was needed. Hall compiled a 10-1 record and a 2.61 ERA. He saved 8 games and threw a complete game shutout, striking out 137 in 129 2/3 innings. He simply got done whatever Sparky needed. Unlike the previous two pitchers in the game, Hall retired the combination of Sanguillen, Hebner and Cash. He let up a single to Rennie Stennett in the 8th but after an intentional walk to Roberto Clemente, caught Willie Stargell looking and retired Sanguillen for a second time for good measure. Hall pitched three critical innings, save for a hit and intentional walk, kept the mighty Pirates off the base path and struck out 4 for good measure. The Reds did not score but the difference was still a single run. In the bottom of the 8th, Hall was lifted for a pinch hitter in an attempt to tie the game. The rally fell short and Hall would be saddled with a no decision. But with the game close, all the Reds needed was one Pirates mistake to knot it up. In the bottom of the 9th and the Pirates three outs from a second straight pennant, Johnny Bench capitalized on a Dave Giusti mistake. His lead off homer tied the game. The Reds would rally and win the pennant when George Foster scored on a Bob Moose wild pitch. The Reds went to the World Series and reliever Clay Carroll was credited with the win for Game 5 after pitching a 1-2-3 9th inning. But the wild Pennant Clinching 9th was set up by 3 terrific innings from The Blade. And that makes him The Sully Baseball Unsung Hero for October 11. 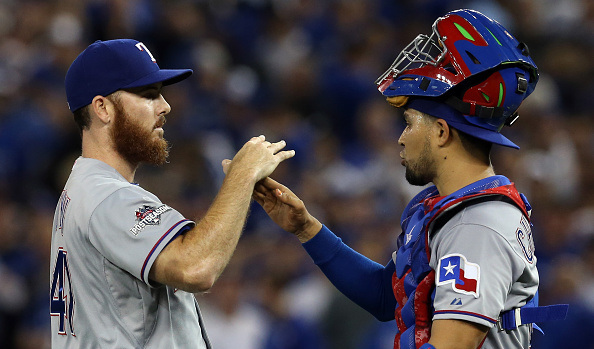 The Rangers have played two game in the post season and have two saves from two different pitchers. And neither of those pitchers are named Shawn Tolleson who led the team with 35 saves. The save became an official stat in 1969. Teams in the post season initially played to the situation instead of using the closer in all close 9th innings. But as saves began to pile up (especially after Tony LaRussa began using Dennis Eckersley one inning at time) and the prices of an innings closers sky rocketed, managers seemed to manage by the book and stick the closer in no matter what. Every once in a while, a team will have multiple pitchers record a save in a post season. It does not happen often, but they pop up. Just last year, the Giants had 3 different pitchers credited with a save. If Tolleson saves a game, then the Rangers will match that total. So here are all the teams to use more than one pitcher to save a game since 1969.